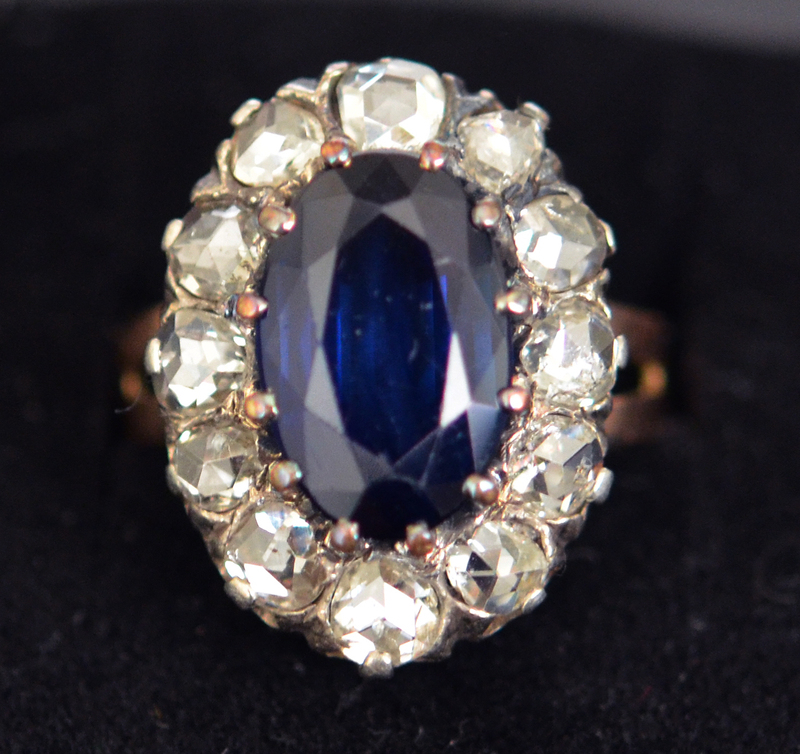 Scarce and magnificent, large sapphire and rose cut diamonds ring from the mid Victorian era of the 19th century. 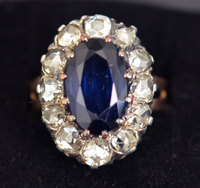 The cluster shaped ring has an oval cut large early synthetic sapphire centerpiece estimated to weigh about 7 carats and measuring 14x9x7mm, surrounded by 12 rose / Dutch cut diamonds of an average diamter of 4mm (roughly 0,15ct. each) and with total estimated diamond weight of about 1.8-2.0 carats. All diamonds are extremely lively, sparkly and with a good white color (H-I) and average VS/SI1 clarity. The oval top face of the ring measures 22x17mm (nearly 1" accross the longer side) and is crafted from 14 karat yellow and white gold. Gross weight of the ring is 6.5 grams. Ring size is a large 60 (UK size S; US size 9), but it can easily get resized. Great and rare to find antique jewelry collector piece and one of the nice and rare antique Victorian sapphire and diamond rings and jewels in general.